The ExaLINK Fusion FPGA Module is an optional, add-in module for the ExaLINK Fusion platform. The module is built around a dense and powerful Xilinx Ultrascale KU115 FPGA. The FPGA has 1.5M logic cells, and 75Mb of BRAM. 48 high speed transceivers are exposed to the ExaLINK Fusion Layer 1 matrix switch fabric. A further 4 ports are available for direct connection to a second FPGA module bay, which may be populated with a second FPGA module or an Intel i7 Skylake module. In addition to the Xilinx Ultrascale FPGA, the FPGA module includes 2x 144Mb QDR-IV SRAM chips and capacity to run up to 32GB of DDR4 DRAM. The module has access to PPS and PTP timing through the host CPU. It can optionally be fitted with a high stability OCXO oscillator for high precision timing. 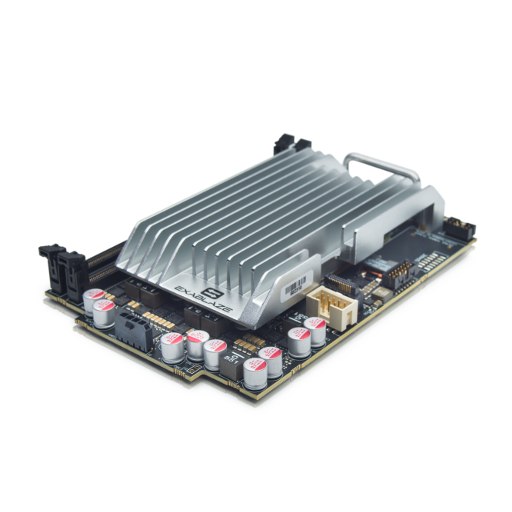 The ExaLINK Fusion FPGA module is available with a complete FPGA Firmware Development Kit , including low latency MACs, memory controllers and comprehensive integration into the management CPU environment.